S.A.W. 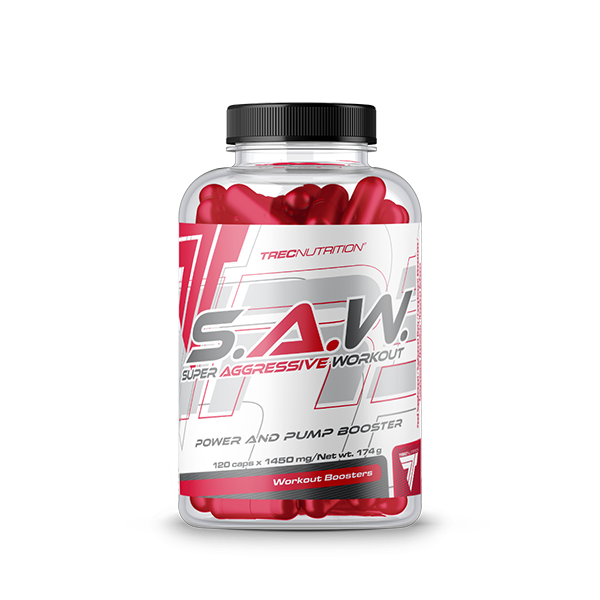 is an ultra-concentrated pre-workout formula for professionals. S.A.W. contains the complex of beta-alanine, caffeine, L-arginine and creatines. Recommended daily portion is 8 capsules. Take 4 or 8 capsules with 300 ml of water. Take 30 minutes before working out. Begin by taking 4 capsules and increase intake to 8 capsules as required. Avoid combining with other products containing caffeine! Please note: Do not take before bedtime! WARNINGS: Do not exceed the recommended daily dose. Do not use the product as a substitute for a varied diet. Children, pregnant or nursing woman must not take the product. Do not use the product in case of circulatory system problems or sensitivity to caffeine. Do not combine with alcohol! Varied and balanced diet and a healthy lifestyle are important. Azorubine may have an adverse effect on activity and attention in children. The product contains naringenin, which can affect the intestinal absorption of certain drugs, leading to temporary changes in their metabolism. Single intake of beta-alanine in an amount greater than 800 mg can cause tingling and numbness. The product may contain allergens such as: milk, soy, wheat, barley, oats, eggs, peanuts and nuts.